These homemade dinner rolls are soft and fluffy and perfect for family dinners or holidays! I have been looking for a good homemade dinner roll recipe for awhile now, and I’ve finally found one that I love! 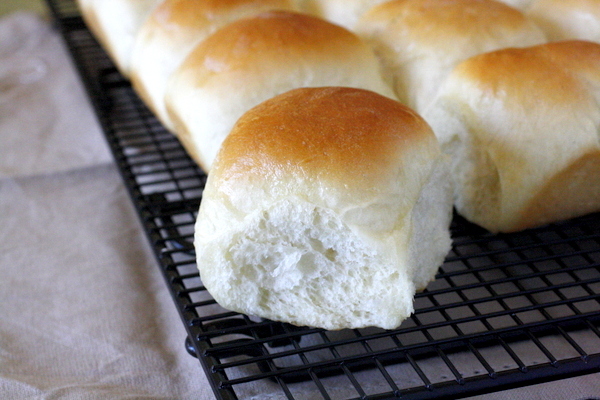 I’m so excited to share it with you because I am guessing you are going to love these rolls as much as we do. 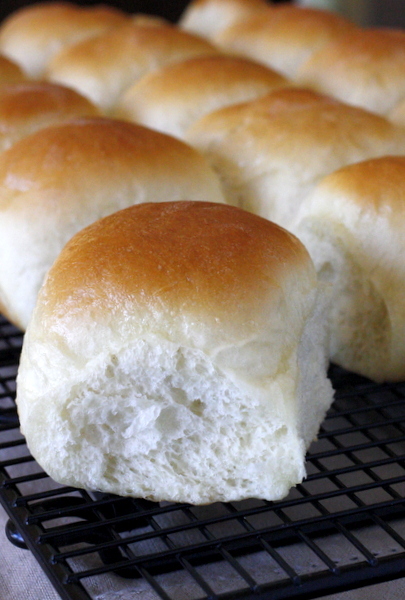 🙂 They turned out so soft and fluffy – exactly what I was looking for in a dinner roll. I am often in charge of rolls when it comes to family dinners and holidays, and this has become my go-to recipe! 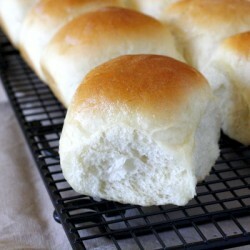 I have made these rolls for countless occasions and they are a big hit every time. I love that there is a make-ahead option – a definite must for busy holidays! If you’re new to bread baking, don’t be intimated. Just follow the instructions as written you will be fine! The key is to add just enough flour to achieve a soft dough that is only slightly sticky. I guarantee you will feel like a rock star in the kitchen when you pull these fluffy rolls out of your oven! 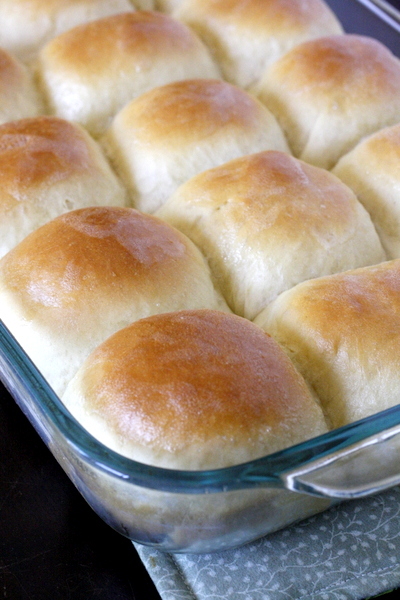 Looking for dinner recipes to pair these soft dinner rolls with? You can’t go wrong with Slow Cooker Mediterranean Pork, Slow Cooked Puerto Rican Pulled Pork, or Orecchiette with Mini Chicken Meatballs! Combine the milk, sugar and yeast in the bowl of a stand mixer. Let sit for 5 minutes or until the mixture begins to foam. Add in the salt, butter, eggs, and 5 1/2 cups of flour. Mix with the dough hook on low speed until well combined. Add the remaining half cup of flour. Change to medium speed and knead until the dough begins to pull away from the side of the bowl, approximately 4 to 5 minutes. The dough mixture should be slightly sticky and soft. Transfer the dough to a lightly greased mixing bowl. Cover with a towel and let rise 90 minutes, or until doubled in size. Lightly grease two 9x13 pans. Punch down the dough and form into 30 rolls. Place into prepared pans, making five rows of three in each pan. Cover and let rise 1 hour. Preheat oven to 375 degrees. Bake the rolls for 12 to 14 minutes, until lightly browned on top and cooked through. Remove rolls from oven and brush with melted butter. 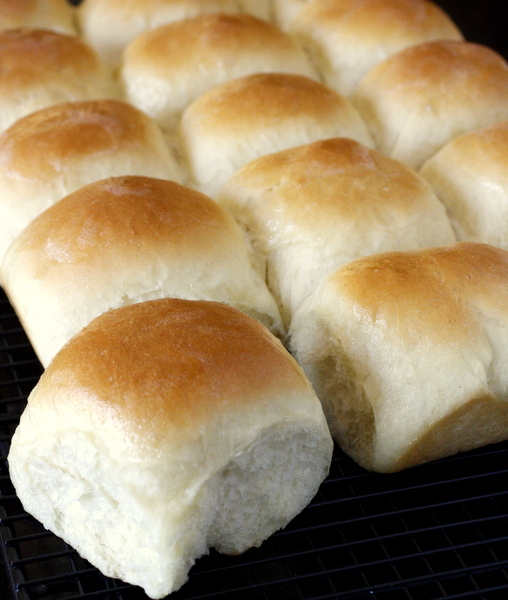 Serve the rolls warm, or to cool, let rest on the pan for 15 minutes before transferring to a wire cooling rack. Once cooled completely, store in a plastic bag. *Note: To freeze unbaked rolls, follow the recipe up through shaping the rolls. Place the rolls immediately into the freezer. Once frozen, transfer them to a freezer bag until you're ready to use them. To bake, place frozen rolls in a greased pan, cover and let thaw and rise,about 5 hours depending on the warmth of your kitchen. Bake as instructed above.